Partners for Parks recognizes individuals and organizations annually who have made significant contributions to promoting and enhancing parks, greenways, open spaces, active play, and recreational opportunities in the community. 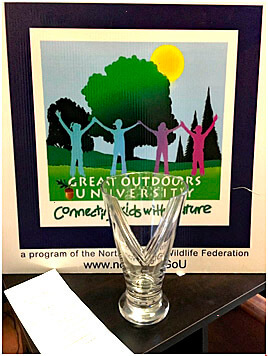 NC Wildlife Federation’s Great Outdoors University was chosen as the Non-Profit Organization of the year. Great Outdoors University offers experiential outdoor opportunities to more than 15,000 youth each year, often in collaboration with local partners. Mary Bures, director of the Federation’s program, accepted the award at the October event.